Jinny Browning (above right) toured the building with her daughters, while guests at the dedication heard from her, the chair of the board Lynn Britton, President Beth Stroble, Provost Julian Schuster and College of Arts & Sciences dean Tony Wallner. 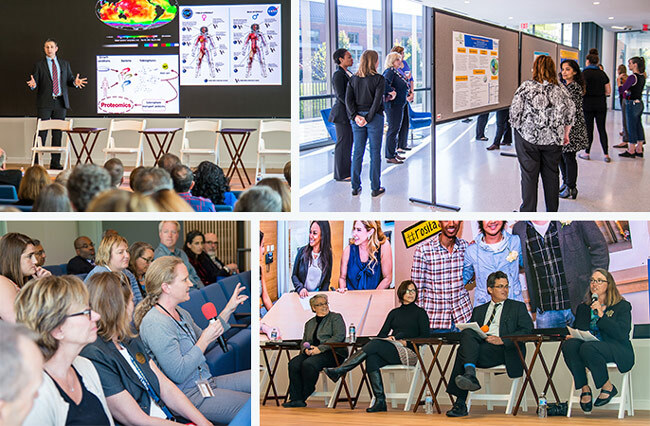 Webster University formally dedicated Browning Hall, the interdisciplinary science building, on Oct. 19 with a ceremony, academic symposium and faculty panel. 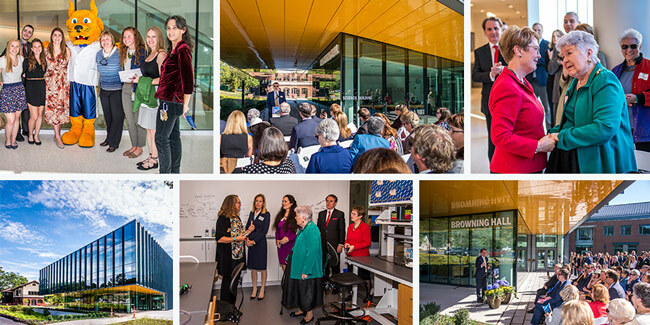 The event welcomed students, faculty, staff, alumni, donors, board members and community guests to tour the new building and get a firsthand look at what it means for Webster University. During the dedication ceremony on Thursday morning, Jinny Browning said that when she first walked in the building she was "just overwhelmed. It is so beautiful, it's so perfect and it is so much the culmination of the dream Larry had, and the future that Beth Stroble is leading us to at Webster University." Jinny and her late husband Larry have been major donors for the building and patrons for arts and sciences at Webster and in the region. Browning Hall is named after their family. Larry Browning, who first became associated with Webster in the '70s and at one time served as a board member, had long raised the importance of a space for sciences to grow at Webster. President Elizabeth (Beth) J. Stroble spoke of the many people over the years who contributed to make this moment possible. “May the spirit of friendship and generosity reflected in the beauty of this building live in each of us now and in the future of Webster University," she said. Lynn Britton, chair of Webster's board of trustees, said Browning Hall supports Webster's mission and meets a promise here and around the world to students and to the communities Webster serves. The building marks a turning point in Webster's history -- a fulcrum for the university's second hundred years, said Julian Schuster, Webster's provost, senior vice president and chief operating officer. Tony Wallner, dean of the College of Arts & Sciences, served as emcee and reflected on the many encounters he has already had with students who shared how the building has affected them. For the academic symposium after the dedication, Webster welecomed back alumnus Vladimir Ivkovic '99, who earned his BA at the Vienna campus. Since graduating from Webster, Ivkovic has become a translational neuroscientist and integrative physiologist working on measuring changes in the brain from such activities as spaceflight and contact sports. In his keynote, "Science as an Agency of Positive Change in the World," Ivkovic discussed the importance of interdisciplinary study: "Interdisciplinarity isn't just a word that sounds good; it's a necessity. Scientists must collaborate. ... Human endeavor is a complex process that requires many different ideas, perspectives and disciplines to provide fodder for progress." In the Q&A following his keynote, Ivkovic reflected on his time as a Webster undergraduate student: "I had the time and ability to focus on the things I really liked in my studies. I had direct access to my professors. I think those things were so important to what I went on to do." Before Ivkovic was introduced, guests saw video messages from Missouri's two U.S. Senators, Claire McCaskill and Roy Blunt. They also heard from Webster board member Peter Wyse Jackson, who is president of the Missouri Botanical Garden and honorary chair of the Browning Hall Dedication Committee. "This building will help us create increasingly important knowledge for the world," Jackson said. "Browning Hall is a fitting tribute to a university of such international stature." Vladimir Ivkovic '99, alumnus from the Vienna campus, gave the keynote, while faculty discussed interdisciplinary opportunities and students displayed posters from their research. They represented their own fields as well as other programs that will benefit from Browning Hall. Several spoke to the importance of "helping students understand the integration of all these disciplines," that now call Browning Hall home, Schroeder said. Woolf emphasized that the sciences are "not a pie you can cut into pieces," but rather they all interact in a push-pull advancement of knowledge and understanding. Stulce and Cuille each spoke to the kind of experiential learning made possible by the building's new labs and technology, with Cuille highlighting the translation lab and teaching kitchen for languages and cultures and Stulce mentioning the simulation labs. Allowing students to learn in simulation settings in addition to hospital settings makes this "a learning environment that feels safe to students," she said. Visitors then had a chance to view and discuss recent or on-going research with students, who had posters of their research on display on all four floors of Browning Hall. VIDEO: Watch the faculty panel here. VIDEO: Watch a time lapse of Browning Hall construction. PHOTOS: See more photos from the dedication events in this Facebook album.